Our goal, in every classroom and subject area, is to make learning relevant to student’s lives. Sometimes that means using technology to dig deeper into a research project, other times it calls for hands-on experimentation. Whatever the means, we want our students to connect meaningfully with the world around them, and never pass up an opportunity to learn. Stop by our Chesapeake Campus, and you'll find kindergarteners learning arithmetic by physically acting out fact families, second graders learning about entrepreneurship by raising the capital to start a business, and fifth graders learning about the Dutch canal system by making a working model. Our Lower School fosters a child-centered learning environment that promotes academic and social achievements for students as individuals and as cooperative members of a group. We believe that young learners have various learning styles, strengths, and areas of growth, and our instructional strategies, activities, and assignments are differentiated to include multi-sensory approaches, materials, and content. Our cross-curricular connections enable students to see how learning is connected across subject areas. Students are engaged in the processes of learning through exploration, discovery, direct instruction, guided practice, individual practice, reflection, and revision. Severn’s comprehensive, integrative Language Arts curriculum prepares students to be life-long readers, writers and thinkers. We focus on a variety of genres from literature and nonfiction to poems and plays. Our curriculum connects subject areas from math to language arts to social studies to science. Reading is instructed through a multi-sensory approach in the Lower School. Reading fluency, phonics, comprehension, grammar, spelling, writing and vocabulary are all integral components of the Language Arts curriculum for students in Kindergarten, First Grade and Second Grade. Students move their bodies to act out letter sound chants or move letter tiles to build and form word families, while listening, saying, and writing letters and their corresponding sounds. Emphasis is placed upon bridging phonemic awareness and phonics to the development of reading fluency. Students are actively engaged in developing an understanding of and making connections to the stories and texts read. Our differentiated, leveled readers lead each child to excel at individually appropriate reading levels, while focusing on the grade-wide themes, skills and vocabulary. An emphasis is placed on the development of writing skills. We believe every child is an author and guide them through the writing process of developing their ideas, to writing a draft, to sharing and celebrating their creations. In Third, Fourth, and Fifth Grades, the focus shifts from learning to read to reading to learn and applying the information and text ideas in meaningful, purposeful ways. Our students study appropriate leveled narrative and expository books and texts related to our Social Studies units and genre studies while expanding reading comprehension and fluency. Our students actively engage in the reading process through reflecting, making connections, drawing conclusions, and analyzing multiple perspectives through peer conversations, multi-media presentations, and written responses. Acquisition of writing skills is achieved through practice of different genres of writing. Students are challenged to write critically and revise and edit effectively. The use of technology and small class sizes enable Severn to dedicate a high level of support to developing writing skills. Differentiated reading groups are flexible and fluid in nature to continually adapt to student’s learning interests, strengths and skill development. Vocabulary instruction is supported by the use of high-quality classroom language, reading aloud to students, wide independent reading and direct instruction of word-learning strategies. At Severn, the goal of our Lower School math program is to develop creative, flexible and strategic thinkers and communicators who can apply skills to solve a variety of mathematical problems. 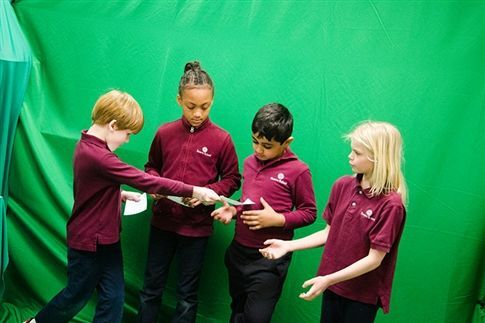 Through investigations and hands-on experiences, students will be able to make connections between what they are learning and the world around them. Math in Focus is our core mathematics program that offers a systematic, coherent, spiraling curriculum. Students develop a strong mathematical foundation and continue to build on this each year as they learn more complex skills and concepts. Our students develop strong number sense, algebraic reasoning and problem solving skills by using concrete manipulatives, number bonds and rectangular bars to represent part-whole relationships. Students are encouraged to persevere with difficult problems and to take risks by testing new ideas and strategies. They are encouraged to become flexible thinkers by solving problems in a variety of ways. Students have opportunities to communicate their math ideas through whole-group discussions and journal writing. Students develop a “toolbox” of mathematical strategies including: guess and check, act it out, find a pattern, make a table and model drawing, which is a visual representation of a math problem. This strategy helps students gain a deeper understanding of the mathematical operations they may employ to solve problems and helps to build a bridge to algebraic thinking and problem solving. Math skills and concepts are weaved into all content areas. For instance, in third grade social studies, students learn about the colonial period in America, and contrast the relative value of wages for labor in contemporary America to wages during the British colonial period. Lower School students see math as a larger landscape, embedded in the world around them. Become a scientist, inventor, and engineer at the Lower School! We believe in providing experiences that ignites curiosity and encourages exploration that lead students to amazing moments of discovery and learning. Science is a process that engages students to explore, hypothesize, design, test, modify, reflect, iterate, and draw conclusions. Students become confident in taking risks through trial and error and communicating their findings as part of the learning process. Exploratory concepts are introduced in the younger grades so that students are exposed to a wide range of life, physical, earth, and space Science themes that they delve into more deeply as the progress into the upper elementary grades. Robotics, engineering, and technology are integral and purposeful components of our program. Our science lab is equipped with tools to engage students in critical thinking, real world connections, problem solving, inductive and deductive reasoning, reflection and revision. The experience and learning extends outside, as our outdoor science classroom, nature trail, and garden provide opportunities for students to experience science first-hand. Various countries and continents are incorporated into units throughout the grade levels. The units promote a world viewpoint that expands beyond Western civilization and promotes a culture of inclusion. When examining each Social Studies topic, students use thinking skills that promote frame of reference or point of view. The use of primary source documents in every grade also encourages students to use their thinking skills to draw their own conclusions. The curriculum covers themes such as Communities and Neighbors, Citizenship, Discovering Cultures, Immigration, Financial Literacy and Entrepreneurship. Service opportunities are closely tied to Social Studies units and encourage students to be thoughtful, engaged, lifelong citizens. Service learning provides students with opportunities to use their newly gained knowledge and skills in real-life situations and helps to build a bridge between academic and civic action. Students understand at a young age that they are members of a larger society, and that their contributions as well as those of their classmates truly make a difference. Our Renaissance program is offered to fourth and fifth grade students as an extension of the Arts and Science programs, with selection based on student choice.